Bologna attraction-guides.com - Bologna, Italy attractions guide Bologna Basilica di San Petronio, church information about attractions, largest church, paintings, sculptures, masterpieces, frescoes, chapels, open hours, admission charges, location and address, tel / telephone number, general tourist information about Basilica San Petronio in Bologna area, Italy (Italia) IT - Last updated 30/10/2012. 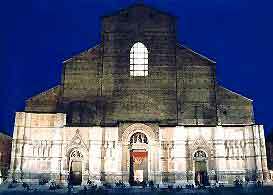 The Basilica di San Petronio is the largest church in the whole of Bologna and building work began more than 600 years ago. Original plans off Bologna's Basilica di San Petronio had to be scaled down after the Vatican declared that the church must not be larger than St. Peter's in Rome, home of the pope. This beautiful basilica remains the fifth largest of its kind in the whole world and houses many spectacular paintings, masterpieces, frescoes, sculptures and historic attractions. Bologna's Basilica di San Petronio church is named after the city's patron saint and contains many attractive chapels.